AKA Time-Life chairs�because they, along with the Eames walnut stools, were originally created for the executive floors of the Time-Life Building in 1960. Also appropriate because, when you sit in it, you'll have the time of your life. Chess genius Bobby Fischer did. He demanded this chair for his legendary 1972 World Championship match with Russian master Boris Spassky, who, when he got a look at the chair, demanded one for himself. This luxurious chair is an example of Charles Eames's belief that "the details are not details; they make the product." Generously sized, the executive chair features the highest quality materials, including an aluminum base and frame and finely detailed leather or fabric upholstery accented with upholstery-covered buttons and edge details typical of traditional fine furniture. 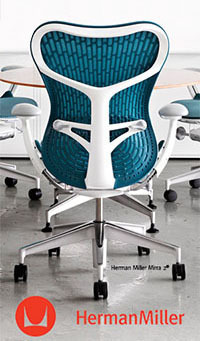 Adjustable seat height, tilt-swivel mechanism, and a stable five-star base add to the comfort. Available with casters or glides, so the chairs can work well in a conference room, board room, conversation area, or behind a desk. Comfort comes first. The seat has 4-1/2-inch-thick foam cushions; the back cushions are 3 inches thick. Armrests are well padded.